Written on August 30, 2005 by Kevin. The past 2 nights now, my wife and I have gone swimming. The first night we watched as a bug flew up above and wham, dive bombed into the pool. Turns out it was a praying mantis. Now just last night, 3 more dive bombed in. Based on the wing designs, we think it may be the same one over and over. We are trying to find what it means to see a praying mantis. If I recall, it means something good. I just cant put my finger on it. Google comes up with a few different suggestions. One saying that praying mantis kneel when angels are near by. Furthermore, they say it is bad luck to kill or hurt a praying mantis (we helped him get to the side of the pool). Whatever the omen may be, we hope its a good one. Maybe one that promises good health, luck or fortune to our son. Maybe it just means the certain praying mantis was either intoxicated or wanted to jump in the pool to cool down. Anyone have any insight on this? Written on August 29, 2005 by Kevin. After taking 8 months to get a pool key for my community pool, we finally purchased my wife a swimming suit (she looks very cute in it). Last night we took a swim and wow it was nice. With the temperature in the day around 110F, the pool must have been at least 80F at 10:00pm. My wife loved the pool as it took all the weight off of her back. On the flipside, getting out of the pool and getting readjusted to the extra weight was difficult. I think my wife would certainly agree that swimming while pregnant is a definite must do. If not to take the weight off, at least to relax the body. A normal Saturday evening? I think not. My wife said she was having pain while eating with my parents and while we went shopping a bit later, she told me that we needed to go to the hospital as she believed her water may have broken. Seeing as we have 2 months to go, this wasn't something that we wanted to happen. As much as my wife wants the pregnancy over with, a premature baby is not what we want. After getting to the OB triage and getting some basic testing done. They came to the conclusion that the baby is just fine and that her water did not break. A sigh of relief. My wife is still a bit suspicious to what exactly happened but we are certainly happy that August 27th was not the birth date. Written on August 27, 2005 by Kevin. While cleaning the house a few nights ago, I heard the Cheers opening theme music. It brought back a lot of memories of when I was a child. Before bedtime, I would make sure I heard that song and then off to bed I went. The song is likely my favorite TV theme song. I wonder what TV theme song that my son may really like. Maybe he will have a different thing that he must do before going to bed. Can the music you listen to as a child help create who you are in the future? Is the fact that the Cheers theme is slow paced the reason why I am calm and (most of the time) reserved? For now, Ill hum the theme and try to think positively about coming into work on the weekend. Anyone have any theme songs that you really liked as a child or that your child likes? Written on August 26, 2005 by Kevin. Here is a great how-to on creating a makeshift baby bottle. These are the types of things that make fatherhood especially fun. Whenever you can whip out your Mcgyver skills it makes it that much better. Written on August 25, 2005 by Kevin. We had a successful walk around the hospital and I was able to confirm where I need to take my wife when she is nearing delivery time. The hospital is laid out very nicely and it seems that they do their best to secure everything. It seems that they put sensors on the umbilical cord that set off sirens if the baby is taken outside a 'safety zone'. This is good news because in the past I have heard babies being taken from our hospital. It seems that times have caught up and the security is likely increased significantly. We learned a bit about birth plans and what to write, and what not to write. A sample plan that a family wrote was basically a novel. Definitely not a good thing to have the doctor reading when you are delivering. Keep it to bullets and make it easier on the yourself and the doctor. This class I observed a husband/boyfriend that really seemed like he didn't want to be in class, and furthermore, dreaded the baby he will soon have. Maybe I am just jumping to conclusions but when you don't pay attention to anything, it says a lot. Its unfortunate that a lot of men cant get over the fact that their lives have changed and they need to accept it as a new start. Written on August 24, 2005 by Kevin. The restoration of the garage sale purchased OFFI Baltic Rocking Horse has been completed. After a few coats of varnish, the horse really cleaned up well. I think that Rylan should be able to get many years of enjoyment out of it. The total cost of the project was about $20. Not that bad considering it gave me a fun project to work on and now I own a rocking horse with a story. I feel bad for the little kids who have to sit on plastic horses. They just don't understand what they are missing out on. Below are a couple further pictures. Another shot of the process as well as the final shot. Can anyone suggest any good names for the horse? Written on August 23, 2005 by Kevin. Written on August 21, 2005 by Kevin. After driving around yard sale hunting for over an hour, I finally came across a home with a few baby items. The first thing to catch my eye was an antique looking rocking horse. I figured she would ask maybe somewhere around the $10 range but to my surprise, she asked a mere $1. Without even looking to see if the item was in good shape, I snagged the horse. First thing to come to my mind was simply sanding it down and repainting it. I began that task today as well. The sanding has begun and the touch up of paint as well (thanks to my mother). Everyone agreed that the horse appeared unique and possibly an antique. The 1930's first came to the mind of my step-father. After a bit of Googling, I was able to find the rocking horse for sale at many online retailers. 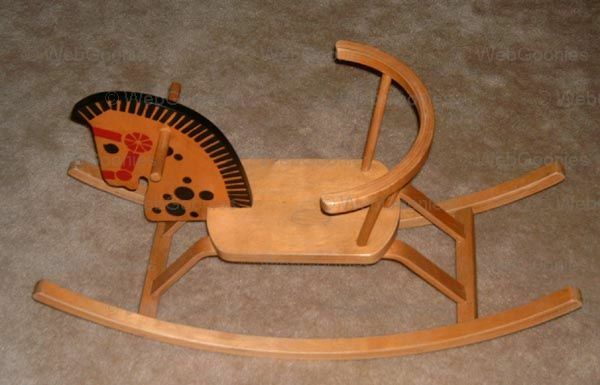 Turns out, the rocking horse is an OFFI Baltic Rocking Horse Chair, imported from Europe. 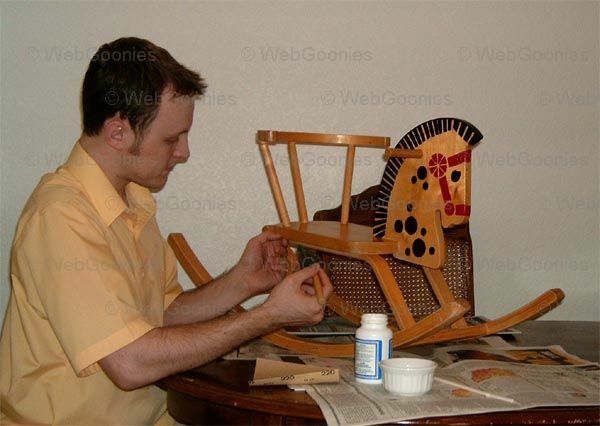 The same rocking horse has been in production for over 50 years and generally sells for nearly $60. The paint and general wear would lead me to believe that my rocking horse is at least 10+ years old. I hope to have this rocking horse restored in the next few days. This horse will go great with the other recent purchase I've made (Schylling wooden alphabet blocks). For now, here is one picture to show the beginning of the restoration journey. There is nothing better than sanding in the garage in the Arizona summer (wipes sweat off forehead). Written on August 19, 2005 by Kevin. Here is a funny link to follow out the week. 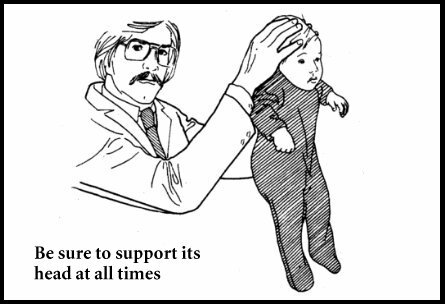 Its dated all the way back from 1979 and explains how to take care of a child if you are a father. I'll let the image below and the link explain the rest. Its always good to close the week with a good laugh, this should do it. Written on August 18, 2005 by Kevin. With a boy on the way, people always tell me to watch out when changing him. The common sprinkler statement then is told. I just came across a product which may allow me to put away my rain coat. The product is called the Pee-Pee TeePee by Urban Baby. They describe this as the ultimate diapering accessory for boys. It simply is a small cone shaped cloth that fits over the baby boys pee-pee and helps prevent the ol' faithful from spewing all over the place. This would certainly be a great item to receive from the grandparents (wink wink). Yesterdays child birth class was not as interesting as last weeks. We watched a few more videos of child birth and learned a few more massage techniques. My wife learned a few positions to help alleviate pain and move the child along through labor. We were asked to draw a contraction in which case, most of the guys seemed to draw a vise grip around the belly or a knife stabbing the belly. On the other hand, women were drawing things like an EKG readout with peaks and valleys. Its interesting to see the difference in views from males and females. Myself, I drew what I wanted to be a vise grip but it came out nothing like it. Lets hope the baby has better drawing ability than I do. Next week, we get to take a tour around the hospital. It should allow me to relax a bit and learn the area. No one wants me running around like a chicken with its head cut off. Written on August 17, 2005 by Kevin. One of the bits of information that I have learned while my wife is pregnant is that it is a good idea for the woman to keep track of her baby's movements. They suggest sitting in a comfortable place and take note of the time you begin. Simply count how long it takes to get 10 kicks from the baby. On average, 10 kicks should occur within an hour. Drinking juice or eating may result in the baby being more active. You should definitely call your doctor if you have not felt at least 10 baby movements within 2 hours. 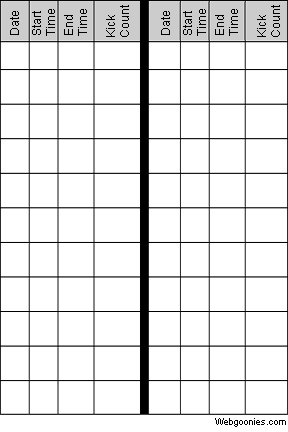 For those women who would like to easily track the baby movements, I have provided an image below which will help organize this task. Written on August 16, 2005 by Kevin. In the past few days my wife has noticed that the baby was not kicking as much as normal. Today, she spoke to her doctor and her doctor made an appointment for a non-stress test (NST). A lot of things go through your mind when your pregnant wife is quickly told to go to the hospital. We went to her appointment this evening and while waiting, I began to get a bit nervous. I wasn't exactly sure what the test was all about but my wife had a pretty good idea. The questions that were being asked really put more bad thoughts into my mind. Basic questions such as "have you had any headaches?" and "are your feet swollen?" seemed to be asked in a negative way which caused me to worry that much more. The test was easy though, which consisted of my wife having a fetal heart beat monitor and fetal movement monitor record data for about 20 minutes. Half way through, they used a device to buzz the baby which caused him to react with a lot of movement and high heart beat. They wanted to make sure the baby's movement was normal and responsive. Overall, the test turned out good and the baby continues to appear healthy. Further information about non-stress testing can be found at the link below. Many times in the past I have recommended eBay for purchasing baby related items [Link] [Link] [Link]. Well, this post is about eBay but from a different side of it. An 11 year old boy sold nearly all of the stuff in his families home over eBay. This included appliances and family valuables. The worst part of this entire story is that he only got $242 dollars from what is worth $60,000. I cannot imagine what I would do to my son if he did something like this. How did the kid get the idea to do such a thing? Simply amazing. Written on August 15, 2005 by Kevin. I have a memory of being under 4 years old and my dad letting me try some beer. I have never been a huge fan of beer and who knows, maybe that's why. A company in Japan though wants your kid to be able to experience a kids version of beer. Kidsbeer is a new product aimed at kids from a company called Tomomasu. They have created a non-alcoholic beer that they hope will catch on for kids. It mimics real beer with its color, fizz and foam. There are many non-alcoholic beers out there but this one seems to take it over the line when they market it towards kids. It seems to me that kids may later on not think about the possible outcome of drinking too much beer. For now, the beer is only sold overseas but apparently it is very popular which would likely result in it coming to our shores. The last thing we need is a drunk kid getting behind the handlebars of his bike. With my baby soon to be here, I have begun trying to plan my schedule. This would mainly include trying to figure out how much vacation time I would like to take off during/after the birth. From my findings, a week vacation is about standard. What do you feel would be a good amount of time to take off initially after the birth of the baby. I understand situations may come up where I would really need to be there however I am trying to get an idea what others think would be a good idea. How much time did you/your husband take off? Would I be starting off on the wrong foot if I only take say 4 days off? Written on August 13, 2005 by Kevin. My wife and mother are both into scrapbooking so the addition of a baby has allowed them to begin work on many pieces. My wife enjoys paper scrapbooking while my mother prefers digital scrapbooking. 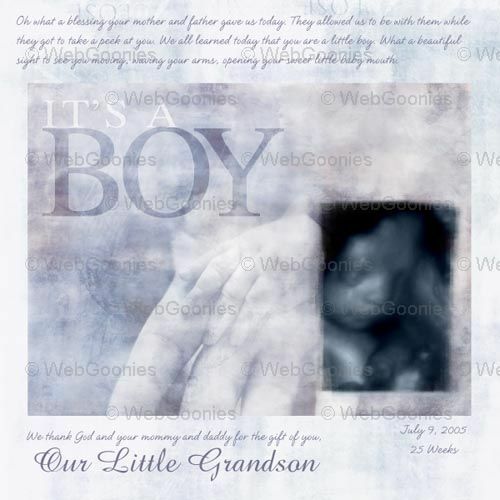 The image below was created by my mother and uses the 3d ultrasound picture that we recently had taken. Its quite impressive what some of these people can do with real paper or digital paper. Definitely takes an artist. I have been trying to get my wife over to the digital scrapbooking world so we don't have a bunch of scrapbooking stuff cluttering the house. 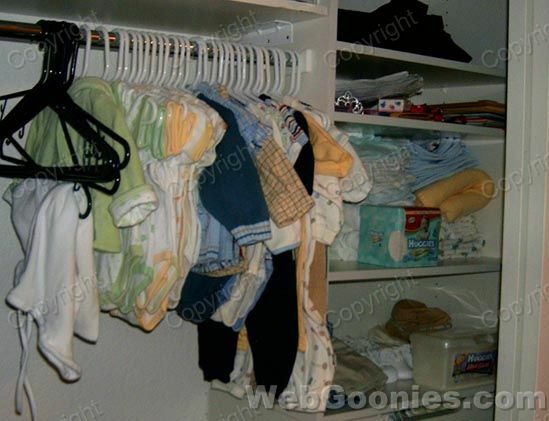 The last thing I want is clutter(choking hazards) with the new baby around. Written on August 12, 2005 by Kevin. As of today, my wife is 30 weeks pregnant which means she is about 3/4th of the way there. As close as it may be, it is not close enough for my wife. With all of the troubles that she has experienced, I can understand why. Keep up the hard work hun, our baby will be home soon. Dish soap in the dishwasher. Written on August 11, 2005 by Kevin. It has happened many times in the past, and will certainly happen many times in the future. 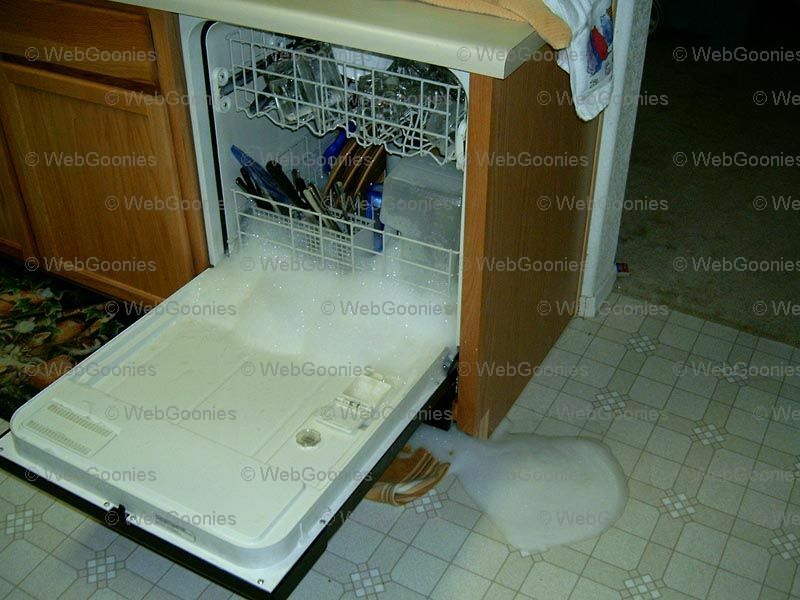 Someone pours dish soap in the dishwasher and all hell breaks loose. I can imagine many parents have had their kids do this type of thing and had to battle the outcome. I wish I could blame it on my unborn child but unfortunately, it was I, that poured dish soap into the dishwasher. Before moving on, look below at the images and get a good laugh. Alright, now that you have gotten that out of your system. Here are some ways to help get the suds to go away. Sprinkle table salt onto suds. Drop ice cubes into bottom to cool the water. Scoop out as much water/suds that you can. Try a cup or two of white vinegar. You may need to run it through the cycle 3 or 4 times to get the suds out completely. After the second cycle, my suds decreased pretty significantly. The second picture below is my wife's idea of a funny picture. Who ever said getting to the back of the dishwasher was easy? My wife and I went to our first child birth class last night. We will be attending four 2.5 hour classes once a week. Right off the bat, our instructor went around the room asking some general information on our baby and asked that everyone say the first thing that comes to mind when you think of labor. Many people gave a very generic answer such as happy, joy, or the all mighty pain. When it was my turn to answer, I turned to my wife and said just one word. 'Sorry.' A sincere apology for what she will be going through in future months. I can 100% say that my answer was the best out of the group. Furthermore, I learned a few techniques of massage for when my wife is in labor and just general stress relief. My wife was taught ways to control her breathing and we followed up the class with a child birth video. Overall, it was not necessarily as I expected, but it was bit informative and seeing all of the dads that seem to be freaking out assured me that I am light years ahead of them. Written on August 10, 2005 by Kevin. Before my wife became pregnant she worked a normal 8 hour day. With the increase of pregnancy related pain, my wife was basically forced to quit her job. She changed her job title from a paper shuffler to the guardian of the bed. One way around the pain, I understand, is simply to try and sleep through it. This would basically include sleeping through the day. My wife has taken this to heart and now naps(tries too) every single day. I have charted out my wife's sleeping habits for the past few days. I wish I could chart out exactly how many times she wakes up each evening/day due to being extremely hot. Besides the Arizona heat, the pregnancy hot flashes she experiences are difficult to live with. The house is normally under 75F and she remains hot while I'm shivering(yes I'm exaggerating) under the sheets. Why is it that my wife had to be one of the women who experience every negative pregnancy issue? What did she do to deserve this? The Baby Einstein movies have arrived! Written on August 9, 2005 by Kevin. The Baby Einstein movies have arrived, subtitles and all. My wife battled on eBay for a 16 DVD boxed set and after about 2 weeks of trying, finally was able to win an auction. Surprisingly, these DVD's were actually in a professional box. I really figured I would get some middle-grade pirated Chinese bootlegs. Except for the Chinese subtitles, the DVD's play as normal and show no issues. From what people tell me, babies eat these movies up. We sampled a few of the DVD's and boy are they better than watching Barney or The Wiggles. Those shows are just crazy and would certainly test my nerves quickly. These Baby Einstein movies are much calmer and seem like they may just work on soothing the baby and keeping a young kid happy. Anyone have any good experience with these movies? Before my wife was pregnant, she would ask me to do all types of things for her. This would include running upstairs to get her glasses which we come to find out are downstairs right next to her (oh the irritation). Now that my wife is pregnant though, she seems to want to be miss independent. She seems to have a tough time now asking me to do very minor things such as getting a glass for her or even throwing something away. I sometimes even have to yell at her when I feel she is doing something she shouldn't be; that could put herself and the child at risk. Is this normal for the woman to become more independent? I know my wife seems to get a kick out of it that I have to yell at her, but dang, just ask me to do something. The least I can do while you are pregnant is get you a glass of water. Written on August 8, 2005 by Kevin. I'm not sure if I should be feeling jealous or not. It appears that my (yet to be born) son has just as many outfits as I currently have. He has clothes ranging from 0 months to 12 months. A good majority of them now have been purchased on Ebay which for a while was my wife's best friend. I think we are definetly prepared for the first bit after he is born. I would hope that it would help take a bit of the stress off and require us to leave the house a bit less. Written on August 7, 2005 by Kevin. As if my wife was not having a terrible enough pregnancy, the battle wages on. The first 2 trimesters consisted of the normal pregnancy pain and sickness. The third trimester however brings the battle to a new level. My wife is now experiencing the Braxton Hicks contractions. The doctor says that these contractions basically prepare the woman's body for labor. She recently went to the doctor and they assured her that it should not be an issue. In addition to the new contractions, my wife has been experiencing other pain which the doctor now says is from the baby lined up correctly and pushing downwards. As the baby continues to grow and his bones get stronger, the pain will increase. I'll continue to support my wife the best way that I can. Written on August 6, 2005 by Kevin. Recently I have received a few request from visitors who would like to see pictures of my wifes pregnant belly. So with no further waiting, I present to you my beautiful wife's belly. Let me first off say that I'm a sleepwalker and furthermore, I get very jumpy/startled at night sometimes. A few nights ago, I awoke to my wife making some pain moaning noises and I caught her while she was starting to sit up. Being the good husband that I am, I immediately sat up and went into panic mode. The first thing that came to my mind was that she was going to have the baby. I began to rub her belly to help her through the pain (like that's going to help). I asked her if her stomach hurts and after a bit more moaning, she told me she had a leg cramp. Phew. Its funny how people get into the zone when they think something is happening. It turns out many women have leg cramps while pregnant and its something that I am now completely aware of. I would much rather lose a bit of sleep (and have a good laugh) than have my wife delivering a baby 3 months early. Written on August 5, 2005 by Kevin. In the past couple of years there have been a few movie families who are immersed in super powers. This would include The Incredibles and now Sky High. Each of the family members in the movies have their own unique super power which helps them save the day. If you had the opportunity, which super power would you give your child? Would it be super strength? incredible knowledge? super speed? Let us know. Written on August 4, 2005 by Kevin. HappyHealthyPregnancy.com recently provided a large list of questions soon to be parents may want to ask on their tour around their hospital. This list appears to be extensive and helpful. Touring the hospital is probably like most situations where you have a list of questions but never remember which ones to ask. I for one will be taking note of the questions and asking them when my wife and I take our tour. Written on August 2, 2005 by Kevin. How comfortable would you be to enroll your child into a school which on their website they cannot spell correctly? I recently ran across a local schools website and they clearly made multiple spelling mistakes. The link can be found here. All Children are capabe of success, no esceptions! The Ace of Clubs - Other caring adults to surround themselves with siginificant, positive adults - to let children know they live in a scoiciety that values them! The Ace of Diamonds - Success breads success. So the question is simply how would you feel about your school if they cannot perform correct spellings or even use a spell checker? Would you look down on these schools or simply let it slide? Does a simple typo make you wonder what other things the staff may be missing. I understand it may be some webmaster who made this page which is not really a school staff member but it seems that multiple people would have reviewed the content and one of them should have noticed the typos. What are your comments? Written on August 1, 2005 by Kevin. Put ingredients in the smaller Ziploc Freezer Bag and zip shut. Take the larger size Ziploc Freezer Bag and put the Ice Cream Bag inside of it then add crushed ice until halfway full then sprinkle 6 tablespoons of salt on top and zip the bag shut. Gently shake, turn, toss and knead the bag so the mix can get cold enough to make ice cream. After 5 or 10 minutes, the liquid from the inner bag will start to harden and turn into ice cream. Rinse off the bag with the ice cream to remove any salt residue before opening and eating. Grab a spoon and enjoy!